While almost every aspect of the career of Churchill has been examined in detail, his contacts with the cinema have been rather overlooked, yet he had considerable interest in the new medium. 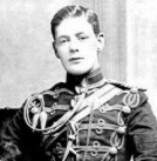 In the same year that the cinema appeared on the scene, 1895, Churchill joined the army, seeing service on the Northwest Frontier, and joining up with Lord Kitchener's Nile Expeditionary Force in 1898. Both Frederic Villiers and John Benett-Stanford brought film cameras to this campaign, a fact which did not escape the young Churchill, who wrote of war correspondents arriving, 'equipped with ice machines, typewriters, cameras, and even cinematographs'. The cinema had evidently entered Churchill's consciousness by this point: he took part in the famous charge of the 21st Lancers at the Battle of Omdurman, and interestingly uses a filmic image to describe his impressions of the experience. 'The whole scene flickered exactly like a cinematograph picture; and, besides, I remember no sound, the event seemed to pass in absolute silence'. The following year the Boer War broke out, and Churchill soon made his name as a daring war correspondent. What is less well known is that he had planned to film the war. It was a joint venture with his friend Murray Guthrie (MP), each to pay half the expenses estimated as not more than £700 in total, to include an operator. But Churchill was booked on the same ship to South Africa (the Dunottar Castle) as W.K-L. Dickson, departing 14 October, and on his way to the ship Churchill wrote a note to Guthrie warning of the competition from the 'American Biograph Co'. He maintained nevertheless that, I have no doubt that, barring accidents, I can obtain some very strange pictures. My only fear is that all the Theatres will be pledged to the American Company. But even then I might make a lecturing tour'. (He did indeed lecture after the war, but using lantern slides rather than films). On board the Dunottar Castle Churchill noted the presence of Dickson's 'party of cinematographers', but also saw that their machine was 'cumbrous' and slow to prepare. In subsequent years Churchill's relations with the cinema blossomed: he became a shortlived 'star' when notoriously filmed while Home Secretary by newsreel cameras at the Siege of Sidney Street in 1910. He was a great admirer of Charlie Chaplin, wrote a laudatory article about him in Collier's in 1935, and spoke at the premiere of City Lights (1931), though his favourite film was That Hamilton Woman (1941) for which he was even rumoured to have written a speech. In 1934 he had been employed by the latter film's producer, Alexander Korda, to write scripts, including a feature film on the life of King George V, though nothing emerged of this. Churchill was also one of the most frequently portrayed figures on the screen, and some sixteen roles have been based on his persona. W.L.S. Churchill, The River War... (London etc: Longmans, Green and Co, 1899).